The Yuri!!! on ICE finale just about killed me today. And I mean that almost literally - I woke up about 100 minutes before it hit Crunchyroll, and simply couldn't get back to sleep again. Ended up just getting up and watching Eupho more than half an hour ahead of time...and well, that was weird, too. Though that's another story, one that I'll hopefully understand a bit better when that finale lands next week. Well, I might as well get to it. Victor's reaction to Yuri telling him "Let's end this" was perfect. Of course Victor wouldn't want to see Yuri leave the ice! Then how it's Yurio who gets Yuri to keep skating! Though it does seem like that was something of a request, a wordless wish from Victor, that Yurio somehow understood! Yuri with a perfect FS performance, trying to tell Victor that he wants to see him skate again. And the idea that Victor would have a fire light up in him again because Yurio and Yuri broke his two records was also brilliant. Clichéd and somewhat unrealistic though his return might be, this was exaclty what I wanted to see! And most importantly: Phichit!! OMG, that ice show idea is something I really really REALLY want to see! I'd watch a sequel just for that! The worst thing about the scoring, however, was Yurio's short program score. I know they wanted him to beat Victor...but they wrote themselves into a corner there and had to give him a score that was mathematically impossible given the content of his short! Victor aiming to return at Russian Nationals? That's just 2 weeks after the GPF! And it usually overlaps with Japanese Nationals! Who's gonna head to Japan with Yuri?! Where was Yurio's "Welcome to the Madness"! Like, dafaq! So yeah, overall, the “anime being anime” elements of YOI, especially in the last two episodes, took a bit of the wind out of its sails for me. It’s still one of my favourites from this year, mostly because the comic timing syncs with me completely, along with how much I loved Victor and Yuri as characters. Now, if you've gotten this far just to see if I would actually write about the "romance"...well, I do have a few brief comments on it. The interpretation that I've written in previous posts still stands: as far as I can tell, Yūri and Victor relate to each other as student-coach, AND as fellow skaters who love their sport, who love the ice on which they perform and everything that comes with it. There is no romantic relationship, and no engagement. There is but the possibility of a romantic relationship, built on the fascinating mutually inspirational bond that they have with each other. I'd also like to think there is something of an inkling that at least one of the two might be falling in love, perhaps unconsciously at present...but even the 'evidence' I would cite here can concievably be explained by other factors. That is my interpretation. You don't have to agree with me--and I know that most people won't. If you want to ask for more specifics, feel free to do so; I suspect, however, that most of you will just dismiss me as being "in denial." But, I'm not, I've just interpreted what we've been presented with through a completely different framework from everytone else -- that of the figure skating world. And for me, that framework means that the ending makes complete sense. It settled everything that needed to be settled, completed the stories that had to be told, and set our characters up for their new beginnings. I am arguably happier about the ending Kubo and Yamamoto gave us than the majority of the fandom, and I am immensely grateful for that. 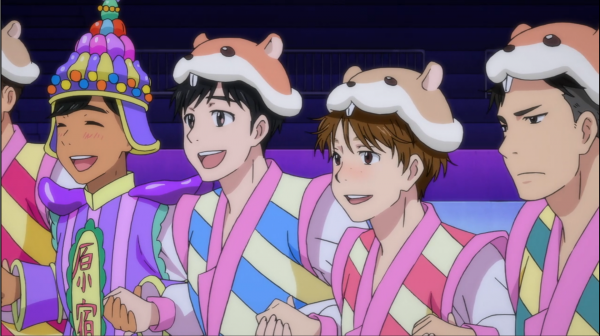 There are flaws--I honestly wish the animation for many skating scenes could have been better, and I would much have preferred to have seen full versions of both Yuri and Yurio's free skates in this episode. Nevertheless, the show did what I wanted it to do, and gave me the ending I wanted to see, the one that I thought was impossible given that Victor is 28... But as Kubo-sensei noted several times in the LOOOONNNG interview I translated last weekend, some things that would be impossible in real life, you can do them in fiction, even if only in fiction. And I'm glad they went for it. I gave up on Eupho. :( I was still trying to make it to the end even after I realized the show had gone in a direction that didn't really interest me, but the ginormous flame war that broke out among the "fans" killed even that ambition in me. I hope the ending works for you! Oh, in what way? My personal take on Eupho 2 is that it's taking a lot of the things I took interest in during the first season to a fitting ending for Kumiko. What Asuka said to her in episode 8 was right on the money, and the episodes since then have involved Kumiko slowly addressing that criticism in terms of her relationships with the people around her. But I did find the flame war ridiculous too (as you know), and I honestly wish people would stop trying to beat a dead horse. Pretty much everything the show had to say to me was wrapped up in Season 1. They had set out to make Nationals instead of just having fun, they learned what kind of dedication it would take to reach that goal, and so on. Plus we got Reina wanting to be her own person instead of fitting in with the group. That was the story I was interested in most, and the Season 1 finale capped it off so well that it really didn't have anywhere else to go. I get what they were doing with Kumiko's character arc, and I can appreciate it, but it wasn't really my focus. Then the season turned out to have so many other shows demanding my attention - Natsume Yuujinchou as I expected, but also March Lion and Flip Flappers, which both surprised me - that Eupho just kind of faded away. And the flame war snuffed it out. My biggest problem with the last episode was the pacing. Everything happened so fast that I had problems to properly process the episode during the first watch. They had the same problem already in other episodes, but in the final, it bothered me for the first time. Not enough that I disliked the episode or be disappointment, but I felt a bit hollow afterwards. The second watch was already much more rewarding. Aside from this I really loved the resolution and Yurio's contribution to it. It also brought the story to a full circle. As he was motivated to give his best by Yuuri, now he tried to motivate Yuuri in his own way. I know I was wrong about Victor, mostly because I underestimated his fighting spirit ^_^. Maybe, even he didn't know before the GPF actually happened that he was not ready to leave competitive skating just yet. So, I'm very happy with his personal resolution, but I really was much more invested in how he tried to prevent Yuuri from retiring (even though it was a bit sneaky), because he loves Yuuri's skating too much and wants him to shine. And that was the most important thing for me as well, I really, really didn't want Yuuri to retire. Seeing the more confident Yuuri appearing during the show and watching his skating, made me want to see how much further he could go. In real life, it doesn't always go as you want, but in this fictional skating world I hoped for a different outcome. I know that one of the role models for Yuuri was Tatsuki Machida, who was such late bloomer and did retire. I lost a bit track with figure skating since the 2000s, so I was not really familiar with him. However, I had my own experience of this sort with Rudy Galindo, because I loved his program in 1996 so much (https://www.youtube.com/watch?v=Pl9kxJLbH88), I was really salty that he didn't win the World Championship that year and sad that he couldn't continue his career for various reasons. So I'm really satisfied that the story of the anime was dedicated to the "what if". That brings me to my last point about this show. I really admire the creative team for the sheer ambition and guts they showed with this anime (because the animation process must have been so crazily demanding). And the love and respect they showed for the sport rekindled my own love for figure skating. That's why I'm really happy to forgive them the few hick-ups and inconsistencies in story and animation. Hm...gawd, it's been so long that I don't remember how I felt about the episode when I first watched it...but I know there were things I didn't quite pick up on until my third or fourth time through, so yeah, I think I get what you mean by the pacing. In fact, I was pretty upset that we only got shortened versions of all the free skates. I wish they'd managed to secure a double-length slot for that finale because I really wanted to see Yuri skate it perfectly in its entirety! I can only hope now that they'll extend the episode slightly for the BD, as has been done for a handful of show in the past! But one thing that Kubo-sensei keeps pointing out in her interviews is how ephemeral it can be. Sometimes you have skaters who have long, successful competitive careers. But in many cases, they succumb to injury or are surpassed by newer up-and-coming skaters. Though of course, the times also affect how we think about that. By today's standards, it looks like Rudy retired pretty late (27 years of age? ), but since skaters weren't really going for the more difficult and dangerous quads back in the 1990s, I'm guessing that was pretty early? Same! I mean, we all knew going in that it would be insane if they managed to animate everything well...and in the end, the production did crumble, and quite early on as well. But unlike some sakuga fans, I'm more willing to forgive them for that because of some of the feats they did achieve with the animation. I'm really looking forward to reading more interviews about how they organised the animation process, because I've been getting a sense that it's been unusual in that regard as well!